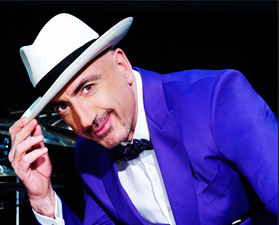 Serhat is a successful singer, producer and show host who chose to work in show business after completing his education with two elite institutions; the German High School and the Faculty of Dentistry at the University of Istanbul. Serhat, a typical Scorpio star sign, entered the world of Turkish Television in 1994 with the most highly rated quiz show of all times, “RIZIKO” (the Turkish version of America’s legendary quiz show “Jeopardy”), where he was the producer and the presenter of the show. He was awarded with the “Golden Butterfly”, which is the most respected award, selected twice in a row as the “Best Male Presenter” by the readers of Turkey’s highest selling and most prestigious daily newspaper “Hürriyet”. His latest TV show was “KALIMERHABA” where he was the producer and the host of the program. This program was shot in Greece and Turkey and hosted stars and celebrities from both countries. His international music career had huge success with the single “Total Disguise” where he performed a duet with the French female singer VIKTOR LAZLO. This song was selected by Radio Venture-New York as one of the most promising 20 songs of 2005 in the USA. The single also topped the charts in many European countries, especially Greece. His next single “Chocolate Flavour” has managed to stay at the top of the charts since its release date in January 2006 and became a popular hit in many European clubs. In 2007, in Belgium, he recorded songs in both English and Russian with the Russian superstar Tamara GVERDTSITELI. The 3 songs were “I Was So Lonely”, “No No Never” and “Ya Plus Ti”, which is the Russian version of “Total Disguise”. They also performed together in concerts in Moscow and at festivals in Belarus and Moldova. The last concert took place on May 2011 at the prestigious Kremlin Palace in Moscow. From 1999 on he participated at several music festivals both as a guest star and as a member of a jury in countries such as Malta, Kazakhstan, Czech Republic, Yugoslavia, Belarus, Macedonia, Moldova and Egypt. Serhat has created and organized numerous competitions and festivals such as the “National and International High Schools Music Contest” where he has been guiding and coaching talented 17 plus year olds with their music careers. “MEGAHIT MEDITERRANEAN SONG CONTEST”, which has been chosen as the “Most Accomplished Newcomer Festival 2003” by FIDOF, is another success of Serhat, where he made the opening act 3 years in a row as the guest star and presenter. His opening show and presentation with Miss World 2002 was one of the most memorable showbiz moments of that year. Dancing has played an important role in Serhat’s life, having studied across a broad range of different styles, including Latin American and Ballroom. For the period of 2 years he was the vice president of The Dance Sport Federation of Turkey.